A hazard tree is any tree that would cause damage to a person or property if it falls. If you're concerned about a hazard tree on your property, call the professionals at Pioneer Tree Service for free quote on removing the tree. Since many hazard trees are close to a house or building, proper tree removal equipment is essential to safely and successfully remove hazard trees, and Pioneer Tree Service will bring the needed equipment to safely complete the hazard tree removal. Remove hazard trees before they fall on your house or other buildings on your property! What is a Hazard Tree? Hazard trees may include dead or dying trees, dead parts of live trees, or unstable live trees (due to structural defects in the tree, damage to the tree from storms, or unstable ground around the tree) that are within striking distance of a home or other building (or people)! In the case of hazard trees, it is best to call a professional tree removal service to ensure the tree is brought down in a safe area of your yard or property. The tree experts at Pioneer Tree Service will evaluate the hazard tree (or multiple hazard trees) and implement the safest way to remove them from your property. Hazard trees are often at a high risk of falling down, having often been damaged and injured in storms, or these are older trees that may be near the end of their life. Pioneer Tree Service uses equipment such as an aerial lift and bucket to ensure that the tree is removed without damaging any nearby buildings, landscaped areas of your yard, and minimizing the damage to your lawn. 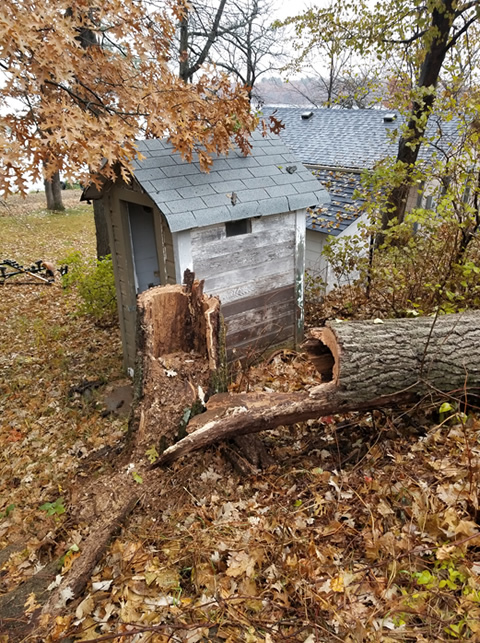 Call 763-238-5254 to request a free tree removal estimate, or fill out the form on this page and someone will get back to you as quickly as possible.